The 13th International conference on Biofuels and Bioenergy, which will take place in Amsterdam on 18-19 February 2019, mainly focuses on the theme “Biofuels: The Future of Energy”. 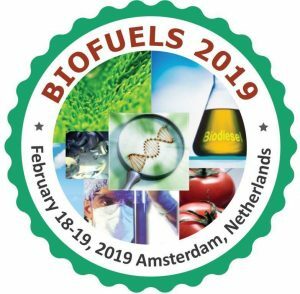 Biofuels 2019 provides a unique opportunity for the participants with various backgrounds to share their research ideas and to learn from other colleagues about the modern scientific improvements in the field of Biofuels and Bioenergy. The aim of the conference is to empower the appealing research field alongside the need of commercialization by giving a chance to meet the specialists and Business entrepreneurs in the field of Biofuels and Bioenergy.